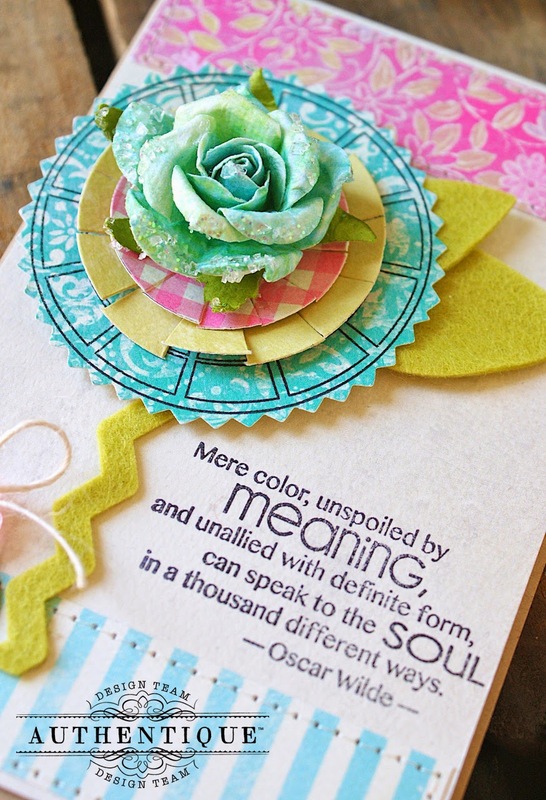 Add Some Color to Your Soul with "Flourish" and Sweet Stamp Shop! I used the "Flourish" collection for my project, because I simply love the bright, Spring colors of this collection, and I also included some coordinating green felt as well for a little texture. I used the "Color Wheel" as the background and first layer for my card and then layered on some additional patterns and colors. I also added felted leaves and a felted ric-rac stem underneath. Then for the top, I simply adhered a nice big, glittered flower to the center. 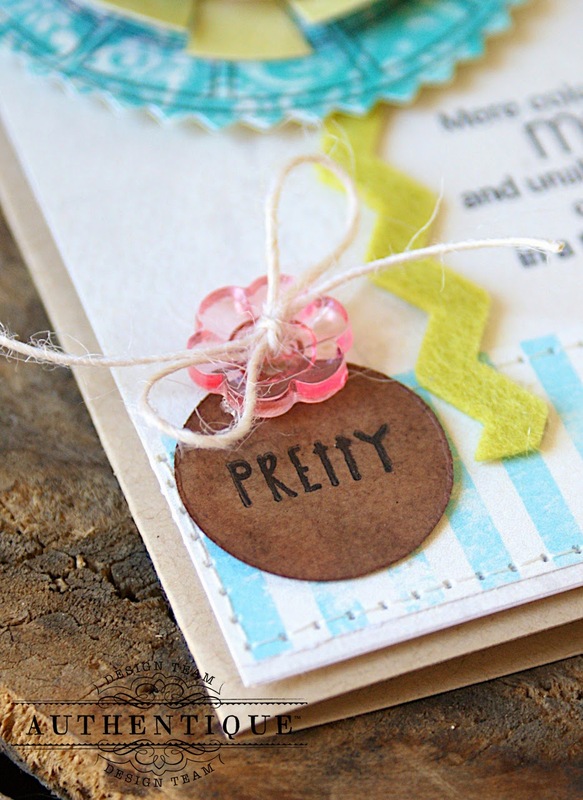 I stamped the "Pretty" sentiment onto a small inked tag and adhered it to the corner and securing it with a pink flower-shaped button. Then finally stamped the sentiment to the right corner of the card. I hope you enjoyed my project using the sweet little stamps from "Sweet Stamp Shop". felt, glittered flower, stamping ink, twine, misc button, corner rounder, small rounded-inked tag, 3-D glue dots, hot glue, kraft cardstock and sewing machine. I LOVE using QUOTES on projects! So pretty, especially the colors! Beautiful card!! love the details! Nice layering. The tag looks like brass the way you inked it. Really great! This project is amazing, Sweet Stamp Shop stamps have SO MUCH variety, I'd love to really start incorporating stamps into my projects! Gorgeous collection! Beautiful paper! Love that one is so very 'boy' and the other can mix with it nicely. Thanks for the Sweet Stamp love! Oh my, what a gorgeous bright card! I love it to pieces! Beautiful! What a great color combo!!! That flower is just gorgeous! Oh wow! That is such a striking card. I love that flower & all the dimension it adds. So pretty! Love the layers on that!! That flower is just gorgeous-love the colors and all of those layers! Beautiful project, I just love the colors! Great projects...love that you partnered with such a great company! :) Thanks for the chance! very very fun, what a great project!! 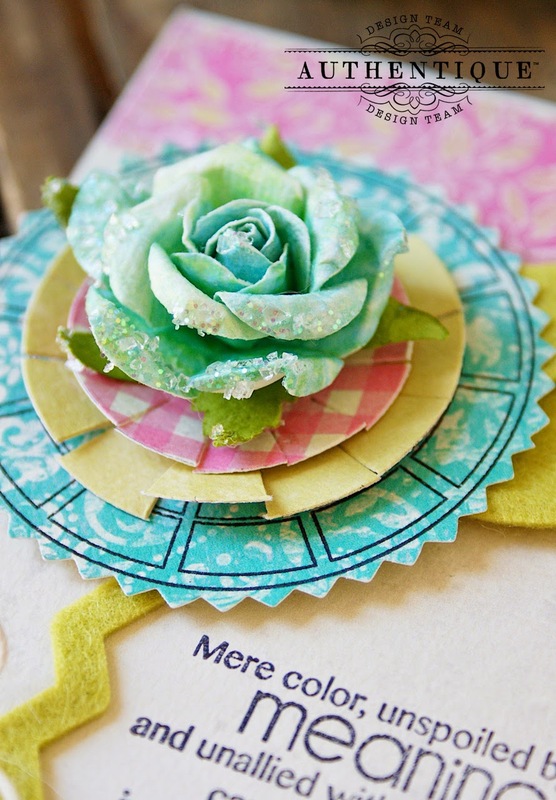 What a gorgeous project...love all of the dimension and the color palette! Love that you also partnered with Sweet Stamp Shop! Thanks so much for the chance to win! Very pretty project. Creative use of the wheel stamp. Love the colors you chose!!! Beautiful card! Love the flower and the quote! Absolutely love this collection and that gorgeous flower! I like that the Flourish collection is so versatile and can be used for cards or layouts both! Perfect quote - perfect card! Came over from Sweet stamp shop. What a gorgeous card!! Just stop by to check the Authentique blog for some inspiration and found this giveaway. Awesome! 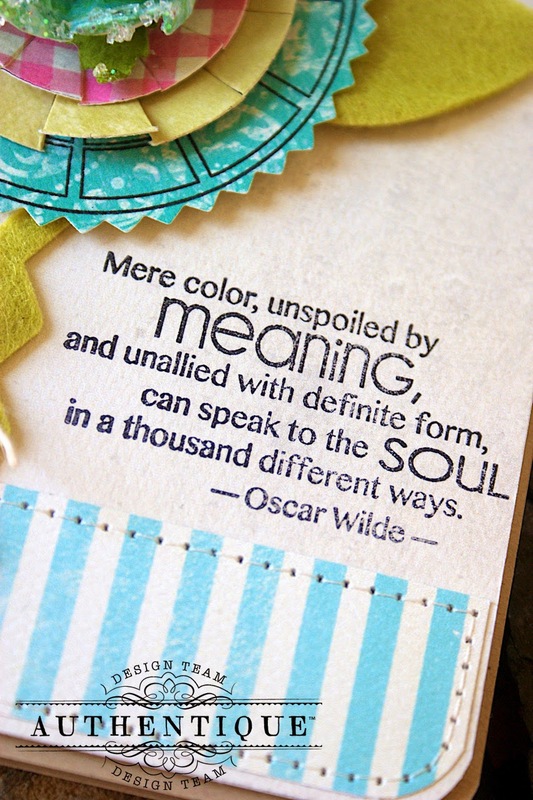 DELIGHTFUL card - LOVE the colours, layers and sentiment!!! Gorgeous card! I love the bright colors and the flower. I love this card because the color combinations of the papers used go together so well. I love this paper so much that I would be hesitant to cut it! I love your 'pretty' tag, it's perfect! Well done! Also have to say the stamps from Sweet Stamp Shop are totally fab! Love it when two fab companies join together and make wonders out of their products! Way to go Authentique! So cute! This paper is awesome. What a great combination, thanks for sharing and the chance. Very pretty. I like the use of felt and the button. Beautiful card! I love the colors and the stamps! Cute card! The flower is great looking. Love your card Hiliary! I own this stamp set and have never used it in this way so thank you for inspiring me once again! Love your rainbow of colors too! Pretty card- love the colors!